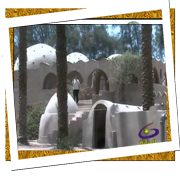 El Harrania village is located on the tourist Sakkara road. 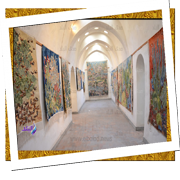 It's considered as a destination for thousands of Arab and Foreign tourists because of the traditional industry of carpets and Kilims. It is the most world wide famous village in Egypt , as it has an archeological character and is famous for important manual and environmental industries; such as industry of loom and carpets without using particular drawings, samples or computers. All they use the fingers, which include islamic and pharaonic drawings, Karanic verses, birds and magical fields. The products of the tourist village is characterized by using the natural colors; such as the leaf tea, roselle instead of the chemical ones, which adds beauty and harmony to the products. These harmony and beauty can't be touched by another products made by the modern machines. The artist eng. Ramsis Wesa Wasef and his wife the artist Sofy Habib Georgy realized the importance of innovation and creativity that everyone has. They realized that using care and appropriate guidance of innovation creativity from a young age can contribute to the revival of industries that are about to extinct so he chose Harrania village to build his school in 1953. The school works include wall textile industry, batik art and pottery are characterized by the techincal maturity and the Egyptian spirit , the school represented Egypt in many buildings built in domes style. Kirdassa is one of the biggest villages in Giza which has its own character in the field or the tourist and commercial manufacturing. It is famous for the manual industries, textiles, clothes, women gallabies made of pure Egyptian cotton. The village contains thousands of workshops and factories, which are specialized of textile, pottery, pharaonic statues, which give the village world wide fame. Moreover, the products are being exported. 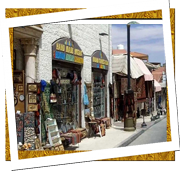 The famous street in Kirdassa is the tourist street where there are many shops with various manufactured products ( manual manufactured embroidered gallabies, hand-made carpets, silver and cooper articrafts, leathers, papyrus, arabesque and shell). This village could made tourism with simple tools from the local environments. These simple tools put the village in an aprominent position on the tourist map.